The 2017 Premier’s Awards for Aboriginal Youth Excellence in Sport were presented in Richmond on Tuesday, March 20 to twelve outstanding Aboriginal youth athletes from British Columbia. Their athletic accomplishments are as extraordinary as their commitment to their community and future aspirations. The awards were presented by the Honourable Melanie Mark, Minister of Advanced Education, Skills and Training, during a formal celebration held during the opening ceremonies of the Gathering Our Voices Youth Conference at the Sheraton Vancouver Airport hotel in Richmond, B.C. The Indigenous Sport, Physical Activity & Recreation Council (I·SPARC), in collaboration with the Government of British Columbia, created the Premier’s Awards for Aboriginal Youth Excellence in Sport to highlight the incredible achievements of Aboriginal youth athletes in the province. The annual awards honour Aboriginal athletes under 25 years of age who have achieved excellence in performance sport, are regarded for their leadership qualities, are committed to a higher education, and are recognized as community role models both on and off the field. From the 48 regional recipients selected in 2017, a total of 12 recipients (six male and six female) were selected to receive the provincial award. Kaitlyn Lafontaine plays basketball for Vancouver Island University. On the court, she helped her team to top five finishes at PACWEST and National Championships. Three years after playing basketball for Team BC at the North American Indigenous Games, she returned in 2017 as an assistant coach. She also coaches at summer basketball camps and with a grade 6 girls basketball team in Nanaimo. Off the court, she is an outstanding student who received the Canadian Collegiate Athletic Association National Scholar Award three years in a row. 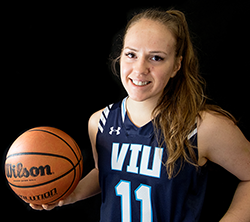 She also received the 2017 Robyn Muir Memorial Award given to the VIU female student-athlete who demonstrates excellence to sport and academics. Kaitlyn will graduate this year with a criminology degree and plans to attend law school. She hopes to specialize in Aboriginal law, so she can give back to the community that has given her so much. William Brewer is known for success in many sports including snowboarding, lacrosse, basketball and track and field. A BC Top 100 Competitor for snowboarding, he’s been a member of the official Sun Peaks Team for three years. At the 2017 North American Indigenous Games in Toronto he represented B.C. on the U16 Box Lacrosse team. He was Team Captain and MVP for his Nicola Valley Minor Lacrosse team which placed second at the Midget Provincials. He also earned the 2017 Track Newcomer of the Year Award from Merritt Secondary School as well as the Junior Athlete of the Year Award. William enjoys helping younger kids with high jump, lacrosse and snowboarding. He wants to coach snowboarding and mountain biking because he enjoys helping younger riders strive to be their best. Sophie Scobie made history at the 2017 North American Indigenous Games when she captained the first female B.C. box lacrosse team. 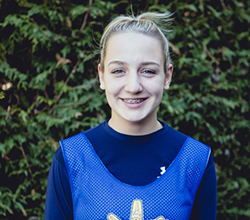 She also helped Team BC to a bronze medal in that inaugural competition and was named the tournament MVP. A double threat, she competed at the 2017 BC High School Track & Field Championships. Sophie successfully balances sport and school, where she is an A student, with volunteering and embracing her culture. She feels fortunate to volunteer with the Special Olympics track meets in Nanaimo and as a peer tutor in her school. She is active in her school’s Aboriginal culture as she takes part in various activities. One of these activities, the “soup group”, brings students together to cook and eat healthy meals together as they build a strong and positive Aboriginal community. As she prepares for university, Sophie plans to include Aboriginal classes in her studies. Mark Anthony Roberts won three U19 rifle shooting gold medals at the 2017 North American Indigenous Games in Toronto. During these Game he also helped coach the athletes in the U16 category. At home, he belongs to his Band’s recreation committee as the youth sponsor. He is currently working on a program to introduce youth interested in rifle shooting to the local gun club as this is how he began in the sport. A member of his school’s drama club, Mark also participates in his family’s Traditional dances and performed for Tribal Journeys 2017. Mark enjoys the outdoors as he gillnets spring salmon each fall for the Elders on the reserve and participates in cultural camps. These camps are accessible only by boat and Mark has harvested a clam garden, learned to pull cedar bark and made a bailer out of cedar. 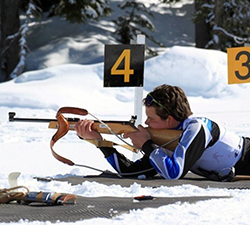 His goals include returning to nationals in target rifle shooting and representing Canada at the Olympics. Alison Desmarais finished 14th at the 2017 Canadian Short Track National Development Team trials despite missing three major competitions due to a concussion. That placing earned her a spot on the 2017/18 National Development Team. At the 2018 Olympic trials she improved her national ranking and qualified for one A final. 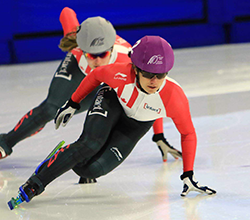 Alison’s speed skating success earned her the 2017 Top Provincial Short Track Athlete award from the BC Speed Skating Association. Beyond competing, she coaches at the Calgary Speed Skating Club and last year volunteered for the Aboriginal Choice Elementary School in Prince George four days a week where she helped with learn-to-skate and hockey programs and classroom activities. Alison also volunteers at competitions, doing any task that needs filling, because she knows how important community support has been to her success. Alison plans to complete her Kinesiology degree while working towards the 2022 Olympic Games followed by medical school. Graham Stewart has helped his rowing teams to many victories including a silver medal at the 2017 BC Championships and a bronze medal at the International Brentwood Regatta. A leader on his crew, he has been in the bow position (steering) for the past two years. He was also named the Gorge Narrows Rowing Club’s 2017 Athlete of the Year. 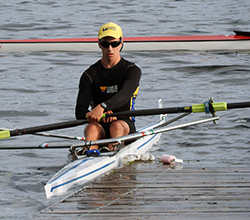 In addition to his dedication to rowing, Graham also works hard as an Engineering student at UVicC, where he received an entrance scholarship based on his outstanding high school grades. Graham first became interested in his Métis culture through his father’s stories. Today, Graham proudly wears his Métis Sash in honour of his grandmother, who taught him the importance of keeping his culture alive for future generations. Amy Levelton Leighton has been swimming with the Prince Rupert Amateur Swim Club for 11 years. She swims seven days a week in addition to fitness and conditioning sessions. At the 2017 North American Indigenous Games in Toronto, Amy won six medals, in six events which included three gold medals. She was chosen Team Captain by her swim club and was named the club’s 2017 Top Female Swimmer 15 and Over. A strong student, Amy is a Peer Tutor and helps younger students in social studies. She also volunteers her time at a local elementary school to help with Aboriginal and Sports Days. Amy says that volunteering for community events such as the Firefighter’s Burn Fund Car Wash and Relay for Life Cancer Walk helps her focus on others. Remaining connected to her Aboriginal culture is important to Amy as she participates in food fishing for the Elders of Metlakatla First Nation and helping her grandmother jar fish. Daniel Everton is a top young B.C. volleyball player. 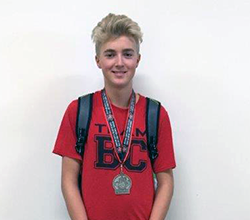 Although chosen as one of the youngest Team BC players ever for the 2017 Canada Summer Games, he decided to captain the 16U Team BC instead at the National Team Challenge. He also captained the Kamloops Volleyball Club’s 17U team to a 13th place finish at the 2017 Club Volleyball Nationals. And as captain of his school team, Daniel was awarded the Top Athlete Award and the Top Overall Student award for his grade, despite being a year younger than his peers. Involved with his community, he volunteers with WE Day, Relay for Life, an annual food drive and helping with Métis dinners in his community. His strong skills on the court combined with outstanding grades have led to four post-secondary volleyball offers. With the support of his family, Daniel is proud to learn more about his Métis background and feels honoured to be part of a culture that has overcome many obstacles in its long history. Kylie Jack is a NCAA Division 2 golfer playing and studying at Simon Fraser University. 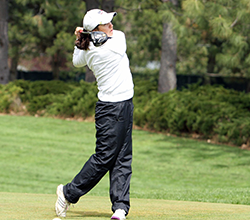 In 2017, she placed second at the Greater Northwest Athletic Conference Championships and helped her team to a ninth-place finish at the Women’s Golf Super Regional. At the Pacific Northwest Golf Association Women’s Amateur tournament in Renton, WA, Kylie finished in the round of 16 after starting the tournament ranked 30th. She embraces the challenge of combining university sport with full-time studies in Criminology while volunteering at junior girls’ golf clinics and with SFU’s Peer Cousins program. When she is home, she volunteers with the Westbank First Nation Youth Program and with Penticton’s Four Seasons Cultural Society. Kylie says that embracing her Aboriginal Ancestry has been a great journey. And when she plays golf, she thanks the local ancestors for allowing her to play on their territory. Kylie plans to earn either her master’s degree in criminology or attend law school at UBC or UVic. 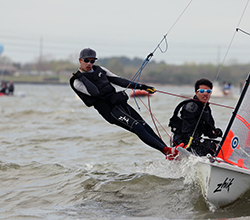 When Zach Spicer began sailing, he spent almost as much time in the water as in the boat. Now in his first year competing internationally, he and his crew placed 99th at the 2017 29er Worlds at Long Beach, California. A member of the Royal Vancouver Yacht Club, his crew won the club’s Commodores’ Cup in 2016, bringing the trophy back to the club after a 12-year absence. Zach was on his school’s honour roll in both 2016 and 2017 and received a sailing scholarship from Sail BC and Sail Canada. He enjoys history, especially First Nations history where Chief Phil Lane Jr. has been an outstanding mentor and encouraging him to learn more. He intends to apply to UBC and McGill University as they have competitive engineering programs and sailing teams. Among his goals are to represent Canada at the Olympics and to inspire Aboriginal youths to get involved with sailing. Hunter Lang was one of six athletes selected by CBC Radio to tell their stories at the 2017 North American Indigenous Games in Toronto. 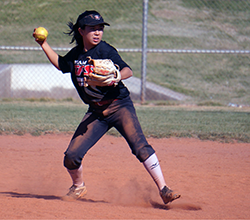 In her softball competition at the Games, she helped Team BC win a bronze medal in the U16 category. She also won silver at the 2017 U18B Provincial Championships. Off the diamond, Hunter is committed to helping others. As president of her school’s Best Buddies club, she spends time socializing and assisting peers who have cognitive and mental disabilities. She is also a member of Athletic Leadership where she manages gym activities, runs intramurals and helps the athletic department. An honour roll student, Hunter also volunteer coaches at a softball camp and earned her Black Belt in Taekwondo after five years of rigorous training. Her goals include playing softball in university and to one day make Team Canada. And she hopes to be like Carey Price and Ashley Callingbull who demonstrate Aboriginal athletic success. Corben Bowen began playing rugby when he was 13 years old. In the past year, he has been selected to the Youth Commonwealth Games 12-man team (injury prevented him from playing), competed at the Men’s Under 18 European Championships on the 24-man 15s team and helped Chilliwack’s GW Graham Secondary to their best ever BC Secondary Schools finish (sixth). 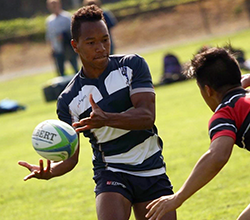 His commitment to rugby earned him numerous awards at the 2017 GW Graham Secondary athletic banquets including Grizzlies Athletics Achievement of Excellence and Most Inspirational Player. 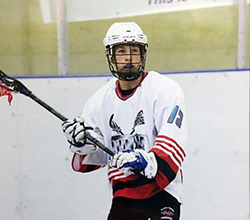 Now attending the University of Victoria with an entrance scholarship, Corben hopes he can inspire other students from Chilliwack to chase their dreams. A member of the Haisla Nation, he speaks to groups and First Nation schools on bullying and what rugby has done for him. After university, Corben hopes to play for Rugby Canada and eventually become one of their conditioning coaches.